We have two research papers and one tutorial at XP2011 in Madrid Spain. RashinaHoda presented her paper "Agile Undercover: When Customers Don't Collaborate" and poster "What Language Does Agile Speak? ", and SivaDorairaj presented his paper "Understanding the Importance of Trust in Distributed Agile Projects: A Practical Perspective" at XP 2010 in Trondheim, Norway. AngelaMartin and JenniferFerreira, Elvis alumni also presented their papers too. 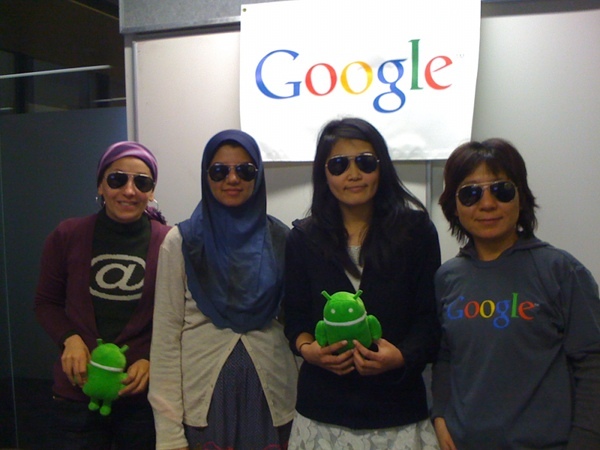 Elvis recently organised playing a live video stream (aka Hangout) of the Women in Tech session held at Google Sydney. Which is now available on YouTube, see Women in Tech @ Google. Some Google swag was also given away. Werner Heijstek gave a seminar on Software Design in Global Development. Yi-JingChung won an iPod Nano for coming 2nd in the Engineering Video Competition and CraigAnslow won a consolation prize. Two opportunities exist to join one of New Zealand's top software engineering groups and to contribute to Victoria's young engineering programme. Robert Bridson from the Imager and SCL labs in the Department of Computer Science at the University of British Columbia gave a seminar on Tracking Liquid Geometry as part of the Victoria University and Weta Digital Computer Graphics Lecture Series. Timothy Jones gave his PhD proposal seminar on Formalising a Structural, Gradual, Pluggable Type System. NicholasCameron, StephenNelson, and JamesNoble attended TOOLS 2010. Nic presented his paper on "Encoding Ownership Types in Java". Stephen presented his paper on "Understanding the Impact of Collection Contracts on Design". Sven Hartmann gave a seminar on Chasing after Potential Secrets in Relational Databases. MySQL was sold for one billion US-dollar. Red Hat is worth a multiple of that. The Eclipse Foundation has pushed many software tool vendors out of business. How come that open source, a phenomenon dubbed "temporary" not only has become sustainable but the business strategy of choice? In this talk, I discuss the four main business models, two for-profit and two not-for-profit, that have made open source sustainable. These models are changing the business of software and are the future of our industry. Susan Eisenbach from Imperial College, London, England gave a seminar on "Concurrent Programming: Is there a silver bullet?". February 2010. At the December Graduation Ceremony RaduMuschevici (MSc) and Jason Xie (PhD in AI) will be graduating, congratulations. Steve Adolph a PhD student from UBC supervised by PhilippeKruchten on Agile Software Development visited Elvis on Friday 18 March, 2011. Stephen Cheng from Innaworks will talk about the A to Z of building a compiler, focusing on everything but the program analysis and optimizations. Stephen will try to cover garbage collection, multi-threading, run-time-library architectural choices, platform specific optimizations, specialized tools developed in-house for building a compiler (such as for debugging run-time library, or profiling etc). He will also talk a little on how code analysis/code generation interact with some of the above topics. Details: Friday, 25th of September, 2009 at 11am in CO216. Members of Elvis have two papers at the ACM Symposium on Software Visualization (SoftVis), Salt Lake City, UT, USA, 2010. User Evaluation of Polymetric Views Using a Large Visualization Wall. Craig Anslow, James Noble, Stuart Marshall, Ewan Tempero, and Robert Biddle. Exploring the Inventor's Paradox: Applying Jigsaw to Software Visualization. Haowei Ruan, Craig Anslow, Stuart Marshall, and James Noble. "Victoria scientists are combining their expertise with collaborators at universities around New Zealand to come up with faster, more flexible and more affordable ways of developing software. The research is part of a four-year project funded by the Ministry of Science and Innovation and has input from a range of industry partners.... James Noble, a professor of Computer Science at Victoria, says the traditional process for developing software dates back to the 1960s and has its roots in computerisation for the space race and weapons development...Victoria postdoctoral researcher Dr Rashina Hoda is investigating how teams should self-organise. She has studied 58 Agile practitioners from 23 software organisations in New Zealand, India and North America over the past four years to understand how they go about self-organising. She has used the information to develop a process others can follow...."
HuiMa and PetraMalik are on sabbatical from July-December 2011. Hui will be in China and Austria, and Petra in Germany and France. PLOP paper on Grounded Theory for Geeks. Rashina Hoda, James Noble, Stuart Marshall. Agility in Context. Rashina Hoda, Philippe Kruchten, James Noble, Stuart Marshall. Tribal Ownership. Nicholas Cameron, James Noble, Tobias Wrigstad. Ownership and Immutability in Generic Java. Yoav Zibin, Alex Potanin, Paley Li, Mahmood Ali, Michael D. Ernst. Using Grounded Theory to Study the Humans Aspects of Software Engineering. Rashina Hoda, James Noble, Stuart Marshall. Human Aspects in Software Engineering (HAoSE) Workshop. Co-located Collaborative Software Visualization. Craig Anslow, Stuart Marshall, James Noble, and Robert Biddle. Human Aspects in Software Engineering (HAoSE) Workshop. Manifesto: a New Educational Programming Language. Kim B. Bruce, James Noble, Andrew Black, Jens Palsberg. Rustan Leino from Microsoft Research gave a seminar on The Dafny program verifier. Roman Klapaukh gave his PhD proposal seminar on 3D Gestures for Graphs. Robert O'Callahan from Mozilla gave a seminar on API Design for the Masses. Luca Fascione from Weta Digital gave a seminar on Rendering and Pipelines as part of the Victoria University and Weta Digital Computer Graphics Lecture Series. 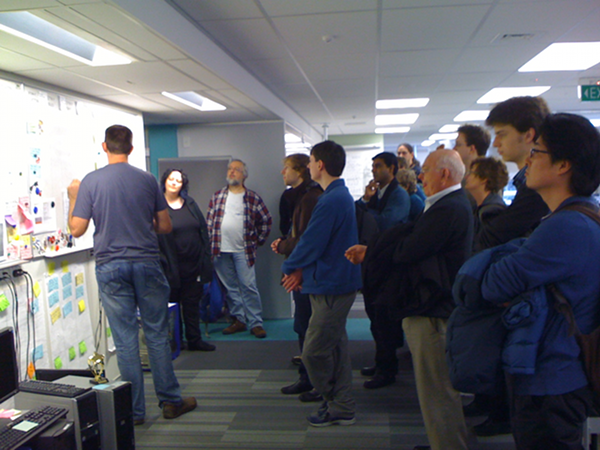 Rashina Hoda gave a seminar on Organizing Self-Organizing Agile Teams. .
Elvis arranged for Philippe Kruchten to give a talk at the Wellington Java User Group (JUG) on "Software architecture and agile software development: a clash of two cultures?". February 2010. Dr. PavleMogin recently retired from Victoria University of Wellington having served the department and faculty for over a decade, from 2000-2012. To help celebrate Pavle's retirement a small party was held with some speeches and a little tribute video was put together: A Tribute to Dr. Pavle Mogin. PaleyLi gave his PhD proposal seminar on Multiple Ownership with Cloning. CraigAnslow presented the Wikipublisher: A Print on Demand Wiki paper at the WikiSym symposium co-located with OOPSLA and Onward in Orlando, Florida, USA. We also successfully organised our Onward workshop on Evaluation and Usability of Programming Languages and Tools (PLATEAU). We had a number of great papers with some interesting discussions. Neal Glew gave a seminar on Relaxed Memory Models. DanielAtkins and CameronFowler (400 Level Honours Students) from Elvis competed in the New Zealand Computer Society Student Contest of the Wellington branch. Daniel talked about X10 and his modifications to the language, while Cameron talked about how he used a Microsoft Kinect device to help aid rock climbers improve their climbing skills. Cameron was awarded second place. SivaDorairaj, JanLarres, MichaelWaterman had papers at the New Zealand Computer Science Research Student Conference (NZCSRSC) 2011 hosted by Massey University in Palmerston North; while Yi-JingChung, AhmedKhalifa, ArthurProtin, CraigAnslow attended the conference. Several other students from different research groups within the school also had papers. AlexPotanin had a workshop on creating effective research posters. RashinaHoda, SivaDorairaj, and CraigAnslow are helping organise NZCSRSC 2010. Please submit a paper. The submission deadline is 31 December 2009. Members from Elvis helped organise the 8th New Zealand Computer Science Research Student Conference (NZCSRSC) 2010 from 12-15 April at the Kelburn Campus of Victoria University of Wellington. SivaDorairaj and CraigAnslow had papers to present. Yi-JingChung and CraigAnslow gave guest lectures on multi-touch user interfaces based on their research for SWEN422 Human Computer Interaction and ENGR101 Engineering Technology, respectively. NeilDodgson from the Computing Lab at the University of Cambridge gave a seminar on Multi-View Autoscopic 3D Displays as part of the Victoria University and Weta Digital Computer Graphic Lecture Series. Most Influential Paper from Onward! Most Influential Paper from Onward!, which honors the Onward! paper from 10 years ago that was judged to be the most influential. 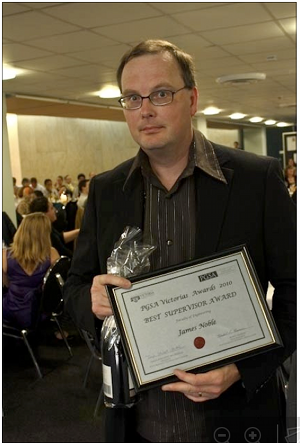 This award was given to James Noble and Robert Biddle for their 2002 Onward track paper: Notes on postmodern programming. MichaelWaterman gave his PhD proposal seminar on Reconciling Architecture and Agile: How Much Architecture? Michael Homer gave his PhD proposal seminar on Language Features for Expressiveness and Reuse. MarkMoir gave a seminar on "Experience with and Potential of Hardware Transactional Memory". I will briefly summarise our experience with the Hardware Transactional Memory (HTM) feature of Sun's multicore processor code named Rock. This experience has demonstrated significant potential in making it easier to construct concurrent data structures that are scalable, efficient, and correct, but also a number of limitations that prevent us from exploiting the full power of HTM. In the second half of the talk, I will focus on the potential of HTM by considering how it can be used to simplify various concurrent algorithms. The goal of this work has been to explore the assumptions needed about an HTM feature in order to exploit it in various contexts. We hope these observations will help guide designers of future HTM features. Bio: Mark Moir is a Distinguished Engineer a Sun Microsystems, and is the Principal Investigator of the Scalable Synchronization Research Group at Sun Labs. Moir received the B.Sc. (Hons.) degree in Computer Science from Victoria University of Wellington, New Zealand in 1988, and the Ph.D. degree in Computer Science from the University of North Carolina at Chapel Hill, USA in 1996. From August 1996 until June 2000, he was an assistant professor in the Department of Computer Science at the University of Pittsburgh, after which he joined Sun Labs. MarcoServetto a new academic staff member working with AlexPotanin gave a seminar on MetaFJig - A Meta-Circular Composition Language for Java-like Classes. MarcoServetto gave a seminar on DEEPFJIG Modular Composition of Nested Classes. ThomasKuehne successfully organised the ACM/IEEE 14th International Conference on Model Driven Engineering Languages and Systems (MODELS) with help from StuartMarshall, HuiMa, and some student volunteers from Elvis. Yi-JingChung and CraigAnslow demoed at the Launch of the new Ministry of Science and Innovation. Jing showed her masters project which is evaluating the accuracy of gestures on mobile phones and interactive touch screens. Craig showed his multi-touch table, various multi-touch applications, and his software visualization prototype. KeithCassell gave his PhD proposal seminar on Using clustering to enhance the maintainability of OO classes. Jennifer Ferreira gave a seminar on User Experience Design and Agile Development in Practice: Where do we go next? Jeff Patton gave a seminar on What I wish universities taught about software development. James Skene who is a post-doc with John Hosking at the University of Auckland gave a seminar on "Descript, a declarative, object-oriented modelling language". Software engineering, or the act of producing software, involves capturing decisions and domain knowledge in abstractions. Ultimately, the programs that we write are abstractions, or models, of their every possible execution. But, in the course of writing a program we may also develop other abstractions, such as domain models, class hierarchies, interfaces, domain-specific representations etc. Ideally, once we have captured some knowledge in an abstraction, we would prefer to reuse that abstraction in other projects, rather than go to the effort of redeveloping it. But, it seems to be difficult to keep track of what artifacts mean over time, and to separate interesting abstractions from non-interesting, project specific ones. In my talk I will discuss Descript, a language that I am developing with funding from the FRST. Descript is an attempt at a language that will allow software engineers to capture abstractions in such a way that their meaning is clear, retained over time, easy to extract, relatively untainted by quotidian detail, and at the same time still useful. It is object-oriented in the sense that it models objects and relationships in the real world. It is declarative in the sense that it has no primitives for modelling actions. Descript is intended to be useful for programming, modelling and metamodelling. It is also intended to address some perceived deficiencies in existing technologies in the model-driven engineering sphere, such as UML, MOF and OCL. Victoria University student brainpower is helping the Firefox web browser go faster. Victoria's School of Engineering and Computer Science has partnered with Mozilla Firefox's Auckland office to carry out research projects, including some which will help improve the performance of the world's second-most popular browser. The collaboration was forged by Dr Alex Potanin, Senior Lecturer in Software Engineering, and internationally regarded New Zealander RobertOCallahan who set up and runs Mozilla Firefox's New Zealand arm. The Auckland Mozilla office concentrates on hardware acceleration or improvements that allow browsers to quickly load big, graphic-rich websites. Recent graduate JanLarres, who came to Victoria from Germany to Complete his Master's degree, has conducted the latest project with his year-long research effort focused on accurate testing of the Firefox browser's speed. "Speed," says Dr Potanin, "is becoming one of the fundamental things that defines a browser. Google Chrome, for example, has a team dedicated to making its browser go as fast as possible." CraigAnslow presented his paper on "Multi-touch Table User Interfaces for Co-located Collaborative Software Visualization" in the Doctoral Symposium at the ACM International Conference on Interactive Tabletops and Surfaces (ITS), Saarbrucken, Germany, 2010. HarshaSubramaniaRaja and CraigAnslow presented at the IEEE Central Region Postgraduate event 2011. Craig was awarded third place for his presentation on "Multi-Touch Table User Interfaces for Co-located Collaborative Software Visualization". KeithCassell and CraigAnslow presented at the IEEE Central Region Post-graduate event. Keith won an honourable mention for his presentation on Using clustering to enhance the maintainability of OO classes. RashinaHoda presented her paper on Organizing Self-Organizing Teams. Rashina Hoda, James Noble, Stuart Marshall at ICSE 2010. Also see the InfoQ article about Organizing Self-organizing Teams. PippinBarr was recently interviewed for the launch of his new book How To Play A Video Game by the Dominion Post in the news article Lecturer's dream job much more than just kids' stuff. ClareLenihan, HughDavenport, JayShepherd, GeoffreySpurr, NeilBecker, JoshuaLindsay, and JamesSullivan presented posters of their honours project to the department and then to industry in the Cotton Club. All the posters looked very impressive and it was a great event had by all. Well done everyone. Haowei Ruan has begun his post-graduate diploma in computer science looking at applying visual analytics to software. Congratulations to DavidFriggens and StephenNelson who graduated in May 2013 with a PhD in computer science. JamesNoble gave a seminar on Grace: a new object-oriented educational programming language. 2nd Workshop on the Evaluation and Usability of Programming Languages and Tools (PLATEAU) in conjunction with SPLASH and Onward! 2010. Call For Papers (CFP), paper submission deadline 13 August 2010. Programming languages exist to enable programmers to develop software effectively. But how efficiently... programmers can write software depends on the usability of the languages and tools that they develop with. The aim of this workshop is to discuss methods, metrics and techniques for evaluating the usability of languages and language tools. JamesNoble attended EuroPLoP and presented the paper on "How Much is Just Enough: Some Documentation Patterns on Agile Projects" by Rashina, James, and Stuart. Elvis recently made a visit to the MetService (weather forecasters) which was kindly organised by fellow alumni AngelaMartin who now works at the MetService and her work colleague Adrian Jarvis. We got a tour of how the software development teams work together, what kind of software they build, and what platforms they are working on. We saw the WeatherScape team which produces the software for TV broadcasts who show the weather news, and got to see some of the forecasters in action. Overall it was a great visit and good insight into an extremely important service within New Zealand. DavidPearce presented his papers "JPure: a Modular Purity System for Java" at the International Conference on Compiler Construction (CC), and "Implementing a Language with Flow-Sensitive and Structural Typing on the JVM" at the Workshop on Bytecode Semantics, Verification, Analysis and Transformation (BYTECODE) as part of the European Joint Conferences on Theory and Practice of Software (ETAPS) in Saarbrucken, Germany, 2011. What Programmers do with Inheritance in Java? Ewan Tempero, Hong Yul Yang, James Noble. NicholasCameron, StephenNelson, and JamesNoble attended ECOOP 2010. Nic had a paper at FTfJP on "Towards a Semantic Model for Java Wildcards". Stephen had a paper at the doctoral symposium on "Identifying and Implementing Relationships". On Monday 5 November 2012, StephenNelson successfully defended his PhD Thesis and is now Dr Stephen Nelson. Congratulations to Stephen! On Friday 22 March 2013, SivaDorairaj successfully defended his PhD Thesis (aka Siva Viva) and is now Dr Siva Dorairaj. Congratulations to Siva! On Friday 15 April 2011, RashinaHoda successfully defended her PhD Thesis and is now Dr Rashina Hoda. Congratulations to Rashina! On Friday 20 April 2012, KeithCassell successfully defended his PhD Thesis and is now Dr Keith Cassell. Congratulations to Keith! On Tuesday 26 February 2013, DavidFriggens successfully defended his PhD Thesis and is now Dr David Friggens. Congratulations to David! ENGR 489 Honours students gave presentations at the 2010 Demonstration Day. All the demonstrations were above expectations. Well done to all students who gave demonstrations. NickVause won an award for the second best demonstration. DavidPearce was interviewed for VBC Radio recently about his Whiley Programming Language, listen to the interview. VBC is a student radio station run from Victoria University's Kelburn campus. In the interview, David talks about his 3-year research project on Whiley, a programming language he has developed, and the need to improve programming languages to make then more reliable and more resistant to hacking. DavidPearce gave a talk at the Wellington Java User Group, On Eradicating the Dreaded NullPointerException, 16 September 2009. 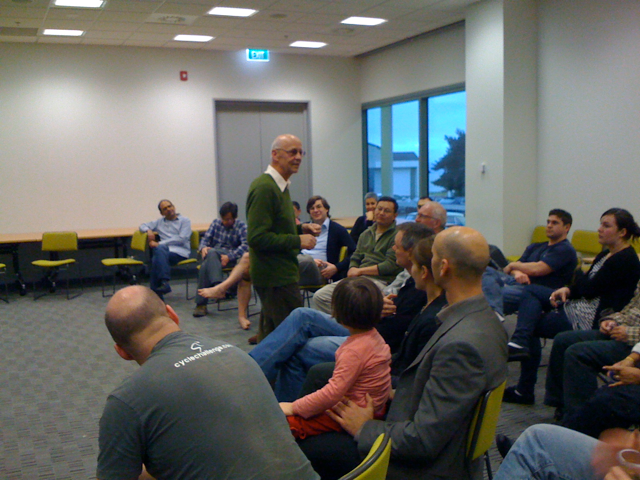 DavidPearce gave another talk this year at the Wellington Java User Group, on Java Puzzlers, 2 December 2009. DavidPearce and JamesNoble attended the Dagstuhl Seminar on Relationships, Objects, Roles, and Queries in Modern Programming Languages, 11-16 April 2010. Craig Anslow gave a PhD Proposal seminar on Multi-touch Table User Interfaces for Collaborative Visual Software Analytics. COMP489 and ENGR 489 (Honours) students gave presentations at the 2010 Conference Day. All the presentations were above expectations. Well done to all students who presented. VictoriaOzorio won an award for the best Software Engineering presentation. Colin Atkinson from University of Mannheim, Germany, gave a school seminar on Boosting Productivity through Search-Driven Reuse. The ElvisChristmasParty2012 was a great success we had lots of people attend including partners and children. The weather was warm but windy and not much sun. Nonetheless we went to CraigAnslow's place for a great fabulous BBQ lunch. Some pictures from the party including Santa! We had some alumni attend including AngelaMartin and HughDavenport. Also of note SivaDorairaj had just submitted his PhD thesis and it was farewell to StephenNelson. The ElvisChristmasParty2011 was a great success we had lots of people attend including partners and children. The weather was cold southerly winds and a bit of sun. Nonetheless we went to AlexPotanin's house for a great fabulous BBQ lunch. We had some alumni attend including AngelaMartin, RillaKhaled and PippinBarr. Also of note it was farewell to KeithCassell who submitted his PhD thesis prior to the BBQ and will leave NZ in the new year. The ElvisChristmasParty2010 was a great success we had 15 people attend. The weather was wet and humid. Nonetheless we went to Picnic Cafe for a great lunch. Once the weather cleared up we played a bit of frisbee at Anderson Park. The field was a little bit slippery and wet which made for some interesting crashes into the ground. Afterward we got a coffee back at the cafe and enjoyed the rest of the day. NicholasCameron was farewelled since he will be leaving us at the end of January. Elvis had their usual ElvisChristmasParty2009 at DavidPearce's house. It was a glorious sunny day. Many sausages, steaks, and salads were eaten, not to mention lots of wine and beer were consumed. Fun was had by all. Even Santa made a cameo appearance disguised as a cat, have a look at the photos. We had one paper at CHINZ 2011. Hien Tran, Craig Anslow, Stuart Marshall, Alex Potanin, Mairead De Roiste. Lessons Learnt from Collaboratively Creating Maps on a Touch Table. Final CFP for submissions to our workshop on Visual Analytics in Software Engineering (VASE), deadline 14 September 2009. Bright Sparks, Dim Future? What's happened to our No 8 wire culture? Nikki MacDonald interviews some people (including PhD student Craig Anslow) and asks whether we're really the No 8 wire culture we think we are. Open source software is publicly developed software. Thus, for the first time, we can broadly analyse in data-driven detail how people program, how bugs come about, and how we could improve our tools. In this talk, I'll review six years of our open source empirical (data) research and highlight the most interesting insights, including how different (or not) open source is from closed source programming. Eitan Grinspun from the Computer Graphics Group in the Department of Computer Science at Columbia University gave a seminar on Animating Physics for Cinema as part of the Victoria University and Weta Digital Computer Graphics Lecture Series. AndrewWalbran (alumni) now at Google London made a visit back to Elvis to catch up with people. Andrew Craik from the Parallelism Research Group at the Microsoft Queensland University of Technology e-Research Centre gave a school seminar on Using ownership to reason about inherent parallelism in object-oriented programs. Andrew stayed for a week and had meetings with various people here working on programming languages and ownership. Manual Alcino Cunha gave a seminar on An Algebraic Approach to Bidirectional Model Transformations. AhmedKhalifa gave his PhD proposal seminar on Ownership and Immutability: Performance Assessment and Programming Experience. JenniferFerreira visiting from the Open University in the UK gave a seminar on Agile and User Experience. JP Lewis from Weta Digital and also a senior lecturer in the School of Design gave a seminar on Accelerating Animation with Machine Learning as part of the Victoria University and Weta Digital Computer Graphics Lecture Series. CraigAnslow was recently interviewed for the Victorious Alumni magazine which wrote an article about his PhD research on A Touch of Magic. Our paper, Qualitas Corpus: A Curated Collection of Java Code for Empirical Studies. Ewan Tempero, Craig Anslow, Jens Dietrich, Ted Han, Jing Li, Markus Lumpe, Hayden Melton, and James Noble. In Proceedings of the Asia Pacific Software Engineering Conference (APSEC), Sydney, Australia, 2010. Won the Best Research Paper Award. For more information see the Qualitas Corpus web site or contact A/Prof Ewan Tempero at the University of Auckland. KeithCassell presented his paper on "Visualizing the Refactoring of Classes via Clustering", Keith Cassell, Craig Anslow, Lindsay Groves, Peter Andreae, and Stuart Marshall at ACSC which is part of ACSW 2011. Associate Professor Thomas Kühne recently received a Distinguished Paper Award at the ACM SIGSOFT MODELS 2010 Conference. His paper "An Observer-Based Notion of Model Inheritance", discusses specialisation relationships between models, languages and transformations respectively, and introduces the idea of an observer and a context for the purpose of defining and validating specialisation relationships.